This week, on dVerse Meeting the Bar,Tony has asked us to repeat, repeat, repeat – whether it’s a word, a phrase or a whole line. Let’s get the musicality going! I haven’t aimed for a particular form, although if I hadn’t submitted a villanelle to a competition, I would have shared it right here, because it is, by it’s nature, a musical, repetitive piece. Hey ho. 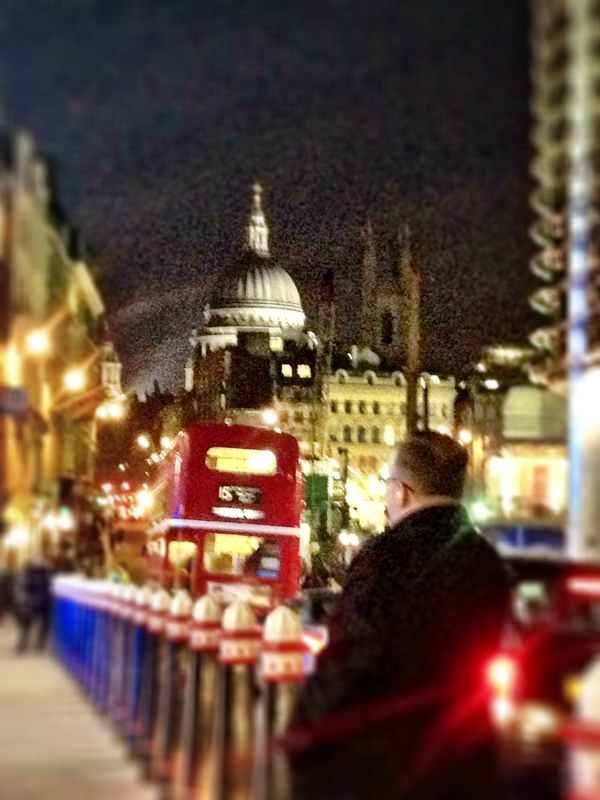 So, ‘London Calling’ is inspired by my place of work and by the wheels going round on my train journey home. I hope you enjoy. ah a skyline i have yet to reach…and our space is ever decreasing especially around the cities…parks decreasing…though i do like what NYC did with the high line as a park…converting the old train rails…. Oh good, I’m glad you get to visit soon! The mix of cultures is one of London’s great strengths, I think. Haven’t been to London for years … and I doubt that I’d recognise much beyond the tourist centres. One thing that never changes is change. Love the title too … it reminds me of The Clash song .. yes, I am that old! Your poem is a great expression of the London I experienced last year: a city with many tales to tell, a variety of people and cultures, its dwellers and workers and, above all, the energy generated by all its various elements – a great cosmopolitan city! You have really captured the energy and beat of the city of London. I think London is like New York, a city that never rests. Yes, I think that’s true. And it is ever-growing…. Thank you, Mary! Millions of stories to tell within the concrete canyons, from an urban sphere centuries older than our oldest cities; a lovely excursion, and imaginative take on the prompt; the form does approach something classic, which echo within the heart of the piece. Thank you, Glenn. I have started using a new train journey home from London and so I think the new views have stirred up new perspectives. Loved this write, made me think of home. I imagine you would love it’s vibrancy! I hope you get the chance, one day. Such a great use of repetition, Freya–both in the lines (not unlike a villanelle, really) and in the skilled rhyming. I hope you win that competition. In any case, hope to read you poem someday. Thank you, Victoria. Well, I’ll keep my fingers crossed! Lovely Freya you are encouraging me to come visit some day. Very well done. Oh you should! Thank you, Michael. I loved this brief dip into London commuter traffic, smiles……..I enjoyed your poem very much. Thank you, Sherry. I also love London when it’s quiet, say early on a Saturday or Sunday morning. Then it takes on a completely different feel. Wonderful! I’m so glad I was persuaded to join in–the poetry and writers are fabulous. Thank you! There are some very talented poets out there, indeed. I’m glad you enjoyed taking part! Thank you so much, Sumana. Maybe someday I’ll get to see London’s changing skyline. Lovely poem! If you can, you should! Thank you, Bryan. I’m a country woman now but grew up in the big city; your description of London beckons me! Thank you, Lynne. I love to visit the country, but my heart is in the hustle and bustle! Yes, I recommend it! Having said that, I haven’t visited Sweden yet… Except via all the Scandinavian noir on the TV – current favourite being Wallander!